Our inaugural festivities started Friday night with a tribute to Jon and Tina Husted featuring all kinds of technology and innovation with demonstrations from some high tech colleges and businesses. The kids loved watching the 3D printers and lasers making key chains and various objects with Ohio’s logo. But everyone was most fascinated by the drone. When 12-year-old Mary asked for a Dr. Pepper, the drone assisted the server in mixing the ice and soda, lifted it straight up in the air, swirled it and then returned it to the server who handed it to Mary! Saturday night’s event was at the brand new National Veterans Memorial and Museum in Columbus. Lots of our volunteers from all over the state attended in spite of the snow. I can’t wait to go back and really look at the exhibits. By Sunday morning, most of our family had arrived at our home in Cedarville and our friend Father Tom Hagan, who runs the Becky DeWine School in Haiti, said Mass for us. I made a small loaf of bread for Communion, and opened an old bottle of wine that my dad made about 40 years ago from grapes that Mike’s father grew. It was a special Mass. Then our whole team headed to the National Museum of the U.S. Air Force in Dayton. The kids loved the flight simulators and wind tunnel, and Mike and I talked about the importance of STEM education for the future of our children and our state. I even got to hold the baby kangaroo that the Columbus Zoo brought! Then we all headed to Colonial Pizza in Cedarville to enjoy our favorite pizza, before heading to our house for a little quiet time and naps before the midnight swearing in. We started the program at midnight. Our friends from Cedarville, the Firehouse Friends, sang the National Anthem and Father Tom gave the invocation. Granddaughter Caroline sang “Down in the River to Pray.” Unable to choose which Bible to use as Mike took the oath of office, I decided to use all of our special ones: Mike’s parents’ Bible; our Bible; Mike’s great grandmother Alice Budd’s Bible; Mike’s Aunt Mickey’s Bible; a small New Testament issued to Mike’s grandfather Albert Liddle as he served in the U.S. Navy during WWI; a small New Testament given to Mike’s grandmother Liddle by her father, a minister, on her 18th birthday, 100 years ago; a small New Testament that Mike and I got in Jerusalem made with olive wood; a study Bible given to Mike by Lloyd Ogilvie, chaplain of the U.S. Senate; and a children’s Bible we gave to Becky on her First Communion. Mike was sworn in by our son Pat who serves on the Ohio Supreme Court, alongside our friend, Judge Tom Rose. What an honor it was to be surrounded by our family and friends. And we will give each of our children one of those Bibles. After a few hours sleep, we all headed to Columbus. The rotunda of the capitol is unbelievably beautiful and Mike took the ceremonial oath of office in the center of the rotunda. I placed the narrow stole that I had sewed from many pieces of Becky’s clothes around Father Tom’s neck before he gave the invocation. Caroline and her friend sang, and all the young grandkids led the Pledge of Allegiance. Everyone in the family had a part. And Mike gave a beautiful speech. The evening’s events ended with the inaugural gala, also in the capitol. Mike and I danced right in the center of the rotunda, where the beautiful black and white inlaid octagon-shaped marble floor starts the pattern of lines that radiate out in every direction. We were surrounded by our children and grandchildren and we loved dancing with the little ones! It was wonderful seeing so many of our friends and supporters during the day. I invited all my children to come to the governor’s residence to spend the night. We had lots of sleeping bags and blow-up beds for the little children. When morning came, everyone really explored the big old house. Grandson Albert played the beautiful grand piano as we all enjoyed a wonderful breakfast of sausage gravy and biscuits, scrambled eggs, and our friend Steve Evans’ sausage. This comfort food really hit the spot so I thought I would share my recipe for the gravy and biscuits (even though I didn’t make it this time). After breakfast everyone went home. And the next morning my phone rang early — our daughter Alice was ready to go to the hospital. Later that day, grandson Tad was born, the most wonderful moment of all! To drippings, add: 1/2 cup flour. Stir over medium heat until bubbly. Add: 2-3 cups cold milk. Stir over medium heat until it thickens. Add reserved sausage to gravy and heat. Serve over hot biscuits. Drop or roll out and cut. Bake at 450 degrees for 8-12 minutes. 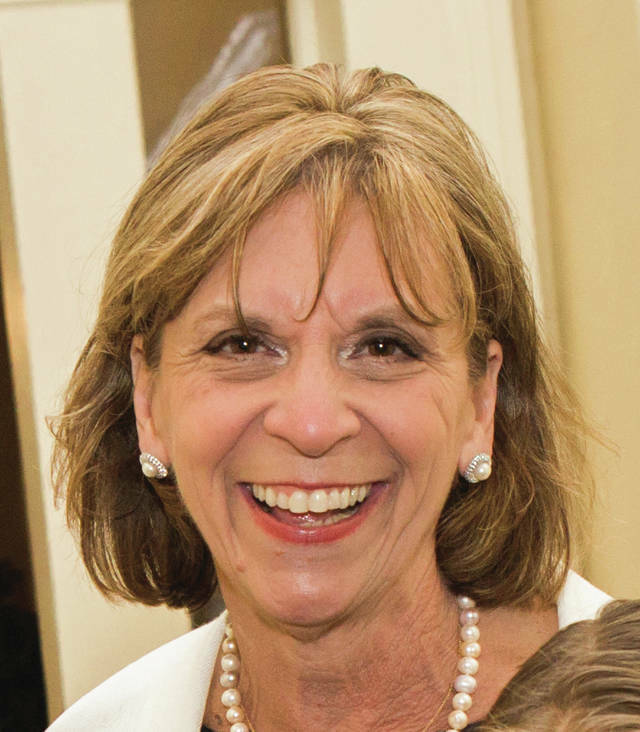 Fran DeWine is a Cedarville resident, guest columnist and First Lady of Ohio.